For All Healthy Living Company has been awarded a year's free rent on a business unit on Weston Industrial Estate, Oldmixon. The competition, run by Legal and General and Knight Frank, was to provide a year's free accommodation for a new start up business. FAHLC has just gone into partnership to create a new social enterprise printing business which will be known as RM Signs Ltd. As well as providing specialist printing services such as clothing printing, banners and more, it will provide training opportunities for local people to learn a trade. A chance to celebrate with a pre-Christmas event. Stalls, raffle, lantern procession and children's activities as well as traditional songs around the Christmas Tree. Come along and enjoy a mince pie or two on Thursday, 15th December from 3.30 - 5.30pm in the foyer of the For All Healthy Living Centre. What Next for the For All Healthy Living Company? What new ideas are there? Both meetings are in the Community Hall. Free refreshments. The Big Draw: An opportunity for people to come along and experiment with colour, shape and scale to create a range of fantasy drawings based on a community theme. Open to all ages, no drawing skills required! Information about work and training opportunities. 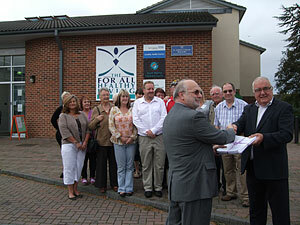 The For All Healthy Living Centre was formally transferred from North Somerset Council to the For All Healthy Living Company from September 1st 2011. Councillor Tony Lake handed over the freehold papers to Bob Sergeant, Chair of FAHLC Board in an event to mark the occasion. Mark Graham, new Chief Executive for the For All Healthy Living Company, talks about his new role in an interview published earlier this week in the Weston Mercury. Mark, former Development Manager for the FAHLC, took over the role following the retirement of Jenny Hendy. In the article, he commented: "I'm very excited about my new role. I will be managing a great team and will oversee how we can provide the best service to the community. I also hope to continue to strengthen the partnership with local people, which is what the social enterprise is all about." Tracey Brownlow, clinical manager has been awarded the Queen's Nursing Institute Award. This is in recognition of her contribution to community nursing. Mark Graham has been appointed as the new Chief Exec. for the FAHLC and starts his new role after Easter. Come and plant in our new allotment on Thursday 31st March. Free drinks and lunch for all diggers! 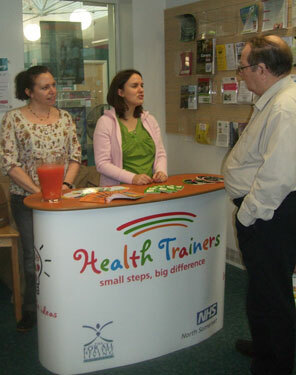 FAHLC now has two health trainers who will be giving advice and information about healthy living from their new 'Pod' on Monday mornings and Friday afternoons. The For All Healthy Living Company is delighted to announce it has just been awarded the Social Enterprise Mark, a nationally recognised Mark which identifies it as trading for social and environmental purposes. For All Healthy Living Company said: "We are delighted to have been awarded the Social Enterprise Mark as it is a clear way of demonstrating to others that we believe in reinvesting in the health and wellbeing of our local community. "As a community based Social Enterprise we believe that it is both an exciting way of engaging with commissioning bodies and ensuring that local people have an influence in shaping of services."